Are you building self-reliance through strategic collaboration with local partners? Does your team pause and reflect on your projects? Are you creating a learning culture within your organization? Have you adapted activity implementation based on evaluation findings for performance monitoring information? The submission period was open from Monday, March 4 to Friday, April 12! The annual Collaborating, Learning and Adapting (CLA) Case Competition captures real-life case studies of USAID staff and implementing partners using a CLA approach for organizational learning and better development outcomes. This is not a call for traditional success stories; we want to hear what’s working well, what you’re struggling with, and what you’ve learned along the way. It can be about something big, or about one small practice that made an important difference to your work. For example, maybe you've used an evaluation to adapt or improve your programming. Your case submission will showcase your team’s innovation and expertise, helping us all move the needle on strategic collaboration, continuous learning, and adaptive management. All eligible case studies will be featured on USAID Learning Lab and may be shared via communications channels such as our blog, and on Twitter. Browse the cases. The competition is open to all types of individuals and organizations working with USAID. What is Collaborating, Learning, and Adapting (CLA)? As development practitioners, USAID staff and implementing partners do their best to avoid these common pitfalls. However, significant demands on time, limited resources, and a need to show immediate results often means that collaborating, learning, and adapting (CLA) effectively to overcome these challenges remains elusive. Collaborating: Are we collaborating with the right partners at the right time to promote synergy over stovepiping? While collaborating, learning, and adapting are not new to USAID or international development in general, they often do not happen regularly or systematically and are not intentionally resourced. To address this, USAID/PPL and its support mechanism, The Learning and Knowledge Management mechanism (LEARN), developed a Collaborating, Learning, and Adapting (CLA) framework to help USAID missions and implementing partners think more deliberately about how to plan for and implement CLA approaches that fit their context and assist them in achieving their development objectives. 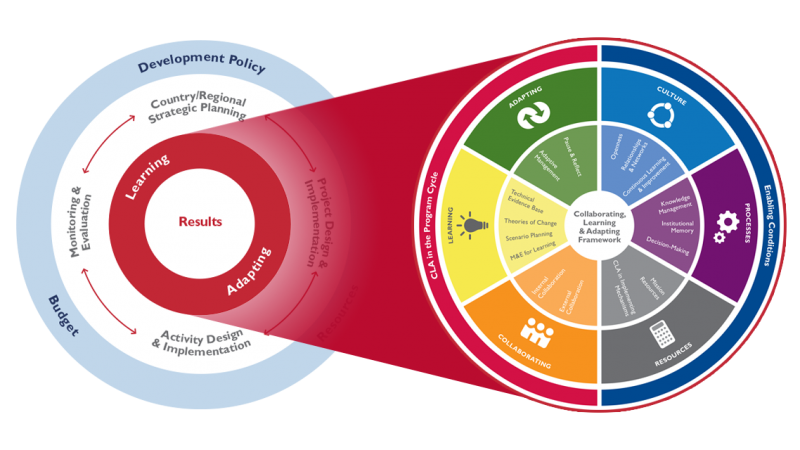 Graphic: CLA framework supports implementation of USAID’s Program Cycle. Enabling Conditions (portion shaded in dark blue on the right-hand side of the CLA framework above): how an organization’s culture, business processes, and resource allocation support CLA integration. Organizations need both integrated CLA practices appropriate for their context and conducive enabling conditions to become stronger learning organizations capable of managing adaptively. The framework stresses the holistic and integrated nature of the various components of CLA to reinforce the principle that CLA is not a separate workstream—it should be integrated into existing processes to strengthen the discipline of development and improve aid effectiveness. View the CLA Framework two-pager to learn more about what each of the subcomponents mean. Want to learn more about CLA? Check out these resources in the CLA Toolkit. Use a collaborating, learning, and adapting approach. Are associated with USAID in some way. The specific activity doesn't necessarily have to be funded by USAID; however, USAID must somehow be connected to the work, such as through collaboration or a partnership, or through an implementing partner improving their own internal CLA-related work, which by extension impacts the work they do with USAID. Are submitted in English by April 12, 2019 at 5:00 pm EDT (be sure to complete steps 1 & 2!). How will my case study be judged? A panel of judges from USAID’s Bureau for Policy, Planning, and Learning and the USAID LEARN contract will review entries. Are intentional, systematic and resourced - CLA doesn’t just happen, it needs to be planned and budgeted. Be sure to write about the decision-making processes behind your CLA approach. Are holistic, covering multiple subcomponents in the CLA framework - The strongest CLA cases involve the CLA in the Program Cycle components on the left side of the CLA framework (Collaborating, Learning and Adapting) and the enabling conditions on the right side (Culture, Processes, and Resources). Have an ongoing effect on your organization and its work - If you choose to write about a conference or one-off event, strengthen your case by explaining how the learning and relationship-building continued after your event. Could potentially be adopted by others - Describe your CLA approach in such a way that someone with a similar development or organizational challenge may replicate it. 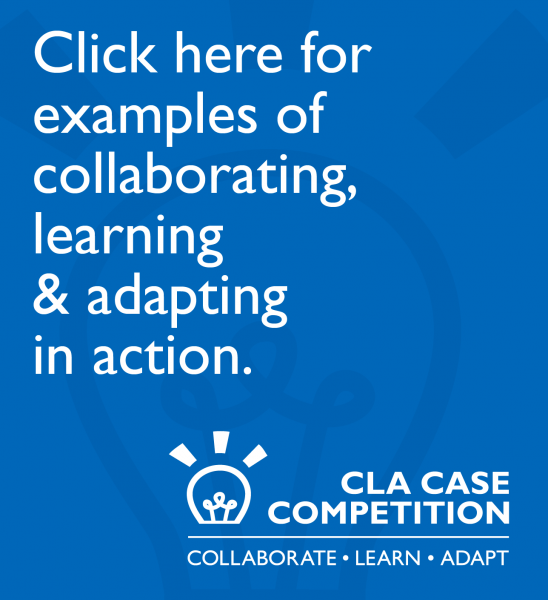 For examples of how others have used a CLA approach, browse our collection of CLA Case Competition submissions or listen to the USAID Learning Lab podcast. How will winning cases be recognized? All eligible case studies will be published on USAID Learning Lab and may be featured in blogs, email blasts, and other social media. Click here to access our full-page searchable map of over 160 Collaborating, Learning and Adapting Case Competition case studies. What is the purpose of the CLA Case Competition? The CLA Case Competition captures real-life case studies of USAID staff and implementing partners using a CLA approach for organizational learning and better development outcomes. Your case studies contribute to USAID’s evidence base of what works and what doesn’t in adaptive management. Can I submit a case about a project or activity that is just getting started? Yes, we welcome examples of newer CLA activities or approaches that are just beginning. Documenting your work for this competition can enable you to be more systematic, intentional, and resourced about CLA in the future. It can also allow you to track your progress as you implement your programming. Do cases have to represent only USAID-funded work? The specific activity doesn't necessarily have to be funded by USAID; however, USAID must somehow be connected to the work, such as through collaboration or a partnership, or through an IP improving their own internal CLA-related work, which by extension impacts the work they do with USAID. If you have a non-USAID case that you'd like to share, we encourage you to contribute it as a blog post or resource on Learning Lab! Can case stories be submitted in languages other than English? Unfortunately, we are not able to process and display case stories in any language other than English. Can I submit more than one case story? Projects are welcome to share up to three (3) entries. There is no limit on how many cases organizations may submit. Please complete a separate entry form for each submission. Can I edit my entry once it has been submitted? If you have an updated entry or additional material you’d like included with your entry, you can email submissions@usaidlearninglab.org. Please be as clear as possible when emailing us as to which entry you are contacting us about. Who is sponsoring the CLA Case Competition? The competition is an initiative of the LEARN contract, a mechanism out of the USAID Bureau for Policy, Planning and Learning, Office of Learning, Evaluation and Research (PPL/LER). They are not, but here’s the link to the ADS definitions. Are there a specific number of pages, font type and size required? Please do not change the presets in the Adobe Fillable PDF. When we talk about culture in the USAID CLA framework, what do we mean? Is it organizational culture? Yes, we mean organizational culture, not country culture. See page two of this document to learn more about what we mean by culture. Can we submit a case when we helped others use CLA, vs. doing it ourselves? Are there limitations on when the case took place? (e.g., is a case from several years ago permissible? There are no time limits, as long as the case hasn’t already been submitted. My project was not fully funded by USAID, its only about 20%. Do you have any requirements on the minimum percentage of the USAID fund in a project to be eligible for this case study? Can we submit entries from U.S. Government projects aside from USAID (for example, State)? Any amount of USAID funding is acceptable. Projects not receiving any USAID funding, or receiving other U.S. Government funding, will be reviewed on a case-by-case basis. Please email submissions@usaidlearninglab.org to inquire. Is there a limit on how many cases one organization can submit (if the organization manages multiple programs)? Is it possible to submit more than one case from one project or activity? Up to three cases may be submitted for each project. There is no limit on how many cases an organization may submit. Will a case that involves an approach to learning from across multiple countries be considered? Can we only focus on 1 CLA sub-component? Because all of the CLA sub-components are so interrelated, we think it would be hard to write a case featuring only one. And, we’re looking for holistic cases that, ideally, draw on both sides of the CLA Framework. What if I have more than 1 example of (multi-faceted) CLA? Can I submit multiple cases or should I put it all into one case? It’s really up to you. If you can pull multiple approaches into one case while telling a cohesive story, that can make a very strong case. However, we also want you to be able to describe your CLA approach step-by-step, so if you won’t have enough space to do that well for such a multi-faceted approach, you might consider submitting multiple cases. The limit is three cases for each project. How much should my case be data-driven? Do we need to be more fact-based? Please include as much data about the outcomes of your CLA approach as you can. However, we recognize that it can be difficult to measure the outcomes of CLA. All types of data and evidence are welcome, and the very nature of the case competition is qualitative. Is the CLA Maturity Tool the preferred tool to use or can we submit a case with our own approach? We welcome cases on any kind of CLA approach. Can the case consist of the approach/methodology we use in our projects? Yes, as long as it also reflects a CLA approach and articulates how your approach or methodology relates to CLA. Can a case be based on the use of tools such as GIS in improving learning? Yes, as long as the focus is on how you used the tool to support intentional, systematic, and resourced CLA. The CLA Case Competition is managed by USAID LEARN, a Bureau for Policy, Planning and Learning (PPL) mechanism implemented by Dexis Consulting Group and its partner, RTI International.